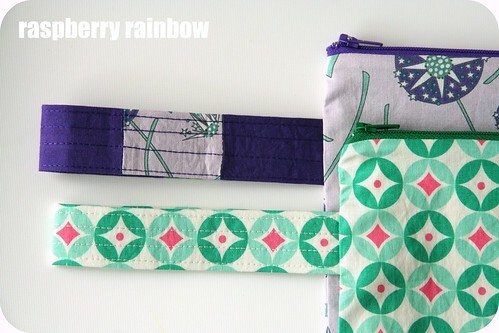 I have not been happy with the straps on some of my other zippered pouches, the ones I use almost everyday. I have one I use as a snack bag for the girls when we are out and about, it is used most days, and often hung from the handles of the stroller. The straps don't hold their shape, and get all bunched up. They need to be reinforced. So this time, I added a very thin iron on interfacing, and top-stitched over the whole strap, 4 rows of stitching. I love the look of the top-stitching. They are very firm now. Only time will tell if this is sufficient reinforcement, I'll test drive the spare one, and probably keep it for me - you can never have too many zippered pouches, right? 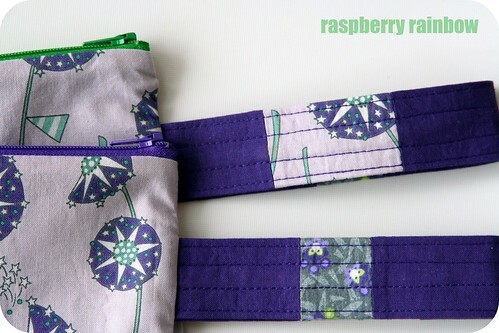 I got all fancy with the straps on the purple zippered pouches, and patchworked some of the fabric scraps with the strap fabric. It was really fiddly to do, but I know I will use this method again as it adds such a special touch. Both of the purple zippered pouched are to be gifts. One of the recipients is my Nana and she has sewed all her life, so I felt the pressure to make hers just perfect. It will be so hard to part with these purple pouches. I love how they have turned out. But that just gives me another excuse to make even more zippered pouches, right? Yes, definitely! Yay to it being Friday! Have a great weekend you lovely people. There's a purple and green theme going on here too. I bought a love purple and green print on my little expidition today. I'm thinking it might make a funky skirt! Ohh love that fabric!! Those zipped pouches will be loved no doubt and yes...too tempting to start more pojects when so many not finished !! Hi Cat...I must admit I am the same, procrastinating terribly with sewing that I feel I have to do, but roaring straight into the creative stuff that I want to sew. 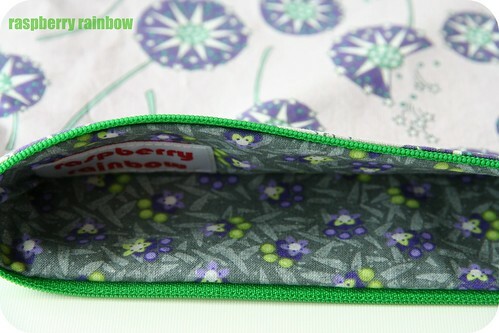 I love the colour of the green zipper, that particular emerald green is growing on me daily. The little patches look so cool on the handles, well done! Beautiful pouches Cat! It's always hard sewing gifts for people who sew themselves - we all want to make sure those ones are especially perfect! I'm sure your Nana will love hers! Love the pouches Cat! The green is my favorite. I find more joy in making things that I "want" to rather than "have" to as well.